A few hours later, when it was clear I wasn’t going to get back to sleep, I started writing a letter to Charlie. I thought I would give it to her when she went to college. I wanted to do a better job preparing her for the tough stuff when it came. I hadn’t finished by the time we had to start our morning routine and returned to it later that night, when the children were all in bed. The words kept coming. Over the weeks and years the daily note-taking turned into a book, which at some point I decided to call “Navigating Life.” I wanted to teach my daughter how to survive so that she wouldn’t find herself in a situation like the one I was in. Over the next decade, as my life stabilized and I sought to make sense of it, I turned to the more positive issue of how to thrive. I wanted to give Charlie the tools she would need to engage with the world and flourish. There were certain things I felt she needed to know—like how to tackle anxiety and fear. Or how to nurture a healthy relationship and know when to leave a toxic one. Don’t we all as parents all want to do better by our children? We all swear we will do better than our parents, but how many of us take the time to stop and think intentionally about what we are doing? I wanted my daughter to know the difference between solitude and loneliness. I wanted to share with her what I had learned, my mistakes, what I felt. Every day I am more convinced that there is a transformative power to revealing ourselves to our children. Here are some of the things I wish my mother had told me and have tried to pass on to my children. Your boss is a real person. So manage them well. Most of them want you to succeed. Always ask if you don’t understand their instructions and remember: their emergency is not your crisis. No one is ever neutral about money. Understand whether or how it motivates you; figure out what your number is and then please learn how to use your calculator. Take time to be alone, off line; it will ground you and help you tackle the crowd. Learn the difference between solitude and loneliness. Don’t save your best efforts for tomorrow. Happiness is not a right. It needs to be earned. You have a choice about how you react to people and events—only you decide whether to focus on the positive or the negative. With my own mother I talked about learning and literature, but not life and love. Maybe that reflected a predictable generational gap where intimacies were neither expected nor encouraged. Facts were fine. Feelings were not. Over the decade of writing the book my conversations with my daughter changed. They evolved from the questions of a 10 year old—who makes the rules and why—to hard choices and who is in charge. And later, as she started to eye the door, we talked about relationships and competition, and what it feels like to be free and on your own. On that Sunday morning after dropping her off at college when I finally gave her the book, standing at the bottom of her dorm stairs, she slipped the envelope under her arm and nodded. For a decade, she had heard me muttering about the book I was writing for her and we both knew this was as much an ending as a new beginning. I gave her a hug and a few bonus kisses and then turned onto the street to take a taxi to the train station and back to her brother and sister, who were waiting at home. 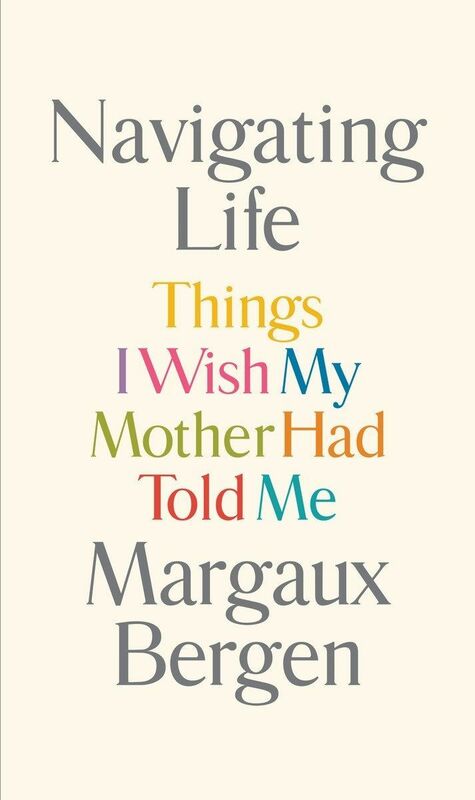 Margaux Bergen is the author of the newly released Navigating Life: Things I Wish My Mother Had Told Me.